Cass Gilbert (1858-1934), one of the country's foremost architects, who created the 66-story Woolworth Building in New York and the U.S. Supreme Court edifice in Washington, designed some of Newark's best-known landmarks. They include the Essex County Courthouse, the Kinney Building, the First National State Bank, Prudential's Gibraltar Building and the American Insurance Building. Gilbert's Essex County Courthouse replaced an earlier structure designed as both county courthouse and city hall in the Egyptian style. The front of the building, which is a pivotal point in a series of county structures, is graced by Gutzon Borglum's seated Lincoln statue. The Kinney Building (1912-1913) is a 12-story structure at the southeast corner of Broad and Market. Architectural critic Donald Geyer describes it as a 'fine example of early 20th century classicism as applied to a large-scale commercial building.' It is constructed of limestone with a granite base. The old American Insurance Co., built in Park Place in 1904, was taken over by Public Service in 1930 as an office space. It was demolished over the protests of area residents to make way for the park and amphitheater on the western side of the PSE&G tower. The bronze doors were incorporated by Michael Graves in the Newark Museum renovation, and the great eagle of the old structure adorns the present company park. The First National State Bank at 810 Broad St. is one of Newark's earliest skyscrapers. Completed in 1912, it has a 12-story tri-partite horizontal facade. Recent architectural alterations have tarnished the building's classical beauty. The Gibraltar Building of the Prudential Group now serves as the New Jersey Superior Court Building. This 14-story tower occupies an entire city block. Its gargoyle ornamentation still dominates the 1926 building. This was the last of Gilbert's Newark buildings and its recent restoration has enhanced its classical beauty. 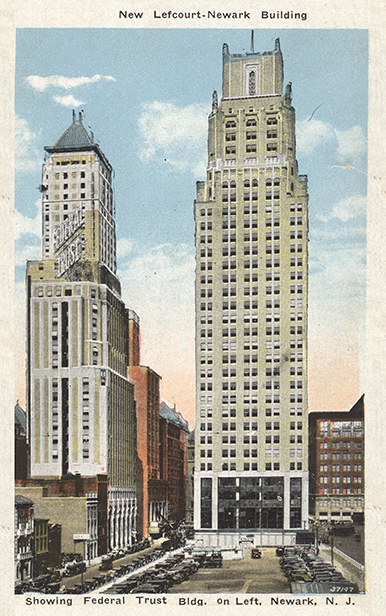 Paul Gmelin, Stephen Voorhees and Ralph Walker designed the New Jersey Bell Telephone headquarters at 540 Broad St., originally the New York Telephone Building. B'nai Jeshurun Synagogue at 17 High St., now Martin Luther King Boulevard, was designed by Albert Gottlieb. The four-story structure built in 1914 shows marked influences of Islamic ornamentation and Byzantine touches incorporated into a Jewish house of worship. The building was designed for the German Jewish congregation founded in 1848 and remained an important part of Newark's history for more than a century. One of the most prolific architectural firms of all times in Newark has been Frank Grad and Partners, now Associates. Grad was born in Vienna in 1883 and educated at both the Vienna Technical School and the Newark School of Art. He was later joined in business by his sons, Bernard and Howard. Grad designed the classically styled YM and YMHA in old High Street in 1921, beginning a career that was to last more than 40 years. Over time, he established one of the most successful companies of its kind in the nation. In 1923, Grad designed the Center Market. In 1925, he drew up the plans for Beth Israel Hospital. In 1927, he designed the glamorous Spanish-court yard-styled Stanley Theater in Vailsburg. He completed plans for the board of education building in 1928 and for city hall Annex in 1929. In 1920 and again in 1929, he suggested an underground parking garage for Military Park. Eventually, it became a reality. Grad's work included a master plan for the College of Medicine and Dentistry of New Jersey, the Graduate School of Business at Rutgers, and a church, convent and school for Our Lady of Good Counsel in the North Ward. Two of his greatest achievements were the designs for the Raymond Commerce Building (Newark Lefcourt Tower), and the Broad Street home of Mutual Benefit Life Insurance Co. The 35-story Raymond Commerce building, which he created, has remained one of Newark's most impressive skyscrapers for more than a half century. The 20-story Mutual Benefit building, finished in June 1956, set the stage for the 'New Newark Movement' and downtown city revival 40 years ago. Michael Graves, a Princeton architect known for his postmodern designs, completed the modernization of the Newark Museum in 1989 in collaboration with Samuel C. Miller, director emeritus. It was a brilliant merging of four separate buildings into one free flowing space. By the dramatic intertwining of these structures as varied as a Victorian mansion, a huge storage area transformed into 60 galleries, the original Dana/Bamberger centerpiece building, and the former YWCA, he created an entity unmatched anywhere in the state. The new building gave the museum's Tibetan, Japanese, African and American collections their own showcases. Yet they remain, at same the time, connected to the museum complex. John Haviland (1792-1852) was probably the earliest non-resident architect to work in Newark. He designed the Essex County Jail at 21 Wilsey St. in 1837 and the first Essex County Court House at West Market Street and Springfield Avenue. Before he came to Newark, most of his work was done in Philadelphia and New York. His designs included churches, theaters and prisons. The New York Tombs and Eastern State Penitentiary in Philadelphia were among Haviland's largest works. The Essex County Jail still stands, although its future is questionable. It is the oldest of the county buildings situated in what is now University Heights and once backed on the Morris Canal. It is a good example of Haviland's Greek Revival period, and has a flat planar exterior. Originally the site included a warden's house. The entire structure is composed of brownstone and brick. In 1838, Haviland began his major work on the Egyptian-style Essex County Court house, which was located to the east of the present Cass Gilbert Court House, approximately where the statue of Lincoln sits. Like the Tombs in Manhattan, the nature of the architecture was somber and foreboding. Few tears were shed when it was removed. J. Robert Hillier was called by N.J. Success magazine in July 1989, 'one of New Jersey's most successful commercial architects.' In reality he was certainly one of the state's best-known new breed of high-tech architects who has attributed a good deal of his firm's success to the 'ability to listen.' By 1989, Hillier's firm has received 100 awards, including honors for the design of corporation headquarters, educational centers and conference facilities. In 1966 J. Robert Hillier, company founder, expanded from a one-room operation into one of the 20 largest architectural firms in the country. By the 1980s, the firm had more than 100 workers involved in $100 million worth of projects. Hillier began operations in the Princeton area, but soon expanded them to include projects in Europe, Mexico and China. The firm's wide range of work extends from the Beneficial Corp. at Peapack, the AT&T Information System at Bridgewater, Dun and Bradstreet, Hoffmann-LaRoche, Rutgers and Squibb. In Newark, where the firm now has offices, Hillier has been responsible for the signage system, the Federal Express Terminal at Newark International Airport, the Marriott Hotel at the airport, the Newark Aids Consortium, an important improvement of the National Newark Building (the old 744 Broad St. building), and St. James Preparatory School. At the New Jersey Institute of Technology, Hillier has been responsible for improvements and the rehabilitation of Campbell Hall, Colton Hall and Weston Hall. The company also has been responsible for the Residential Life Complex and the newly completed School of Architecture. At Rutgers University, Hillier's work centered on the Center for Law and Justice and Woodward Hall. At the University of Medicine and Dentistry of New Jersey the Environmental Occupational Health and Sciences Institute and the heliport are Hillier designs. Howard Horii, senior principal for design of the Grad Associates and a leading New Jersey architect, has spent his entire professional career at the firm and has been a major contributor there for more than 40 years. Born in California, he was in high school—in the middle of completing an art scholarship—when he and his family was interned with 10,000 Japanese-Americans for three years during World War II. Upon release, he moved to New York City, where he worked for 13 years while attending the Art Student League and Cooper Union. He eventually received his certificate in architecture from Pratt Institute. The recipient of more than 150 design awards, his basic premise has been that 'designs should meet specific client needs and that their form and style is economically distinctive and ageless.' During his nearly half century of design work, Horii has seen the emergence of styles from 'modernism, formalism and post modernism, neo-classicism, deconstructivism and many hybrid idioms.' His major Newark work includes redesigning Two Gateway Center, Public Spaces and Three and Four Gateway Center. Other New Jersey work includes the AT&T master plan at Bernards Township; Raritan River Center, Piscataway; BASF Corp. at Mt. Olive; Office Building and Hotel at Short Hills, and major Prudential office space at Parsippany, Roseland, and Holmdel. Hughes and Backoff designed Blessed Sacrament Roman Catholic Church at Clinton Avenue and Van Ness Place in Spanish Renaissance style, and Hughes and Horton designed Holy Trinity Church at Adams and Warwick streets, facing Independence Park in the Ironbound. Two towers rise 80 feet from the Venetian Renaissance structure. Architect Jarvis Hunt was a big name among turn-of-the-century American church designers. His two Newark buildings—L. Bamberger's at 109-35 Market St. and the central building of the Newark Museum complex—remain solid landmarks which should last well into the next century. L. Bamberger's, later Macy's and now a collection of shops, was completed in 1912. Additions were created in the 1920s. A Jewish merchant prince turned his great department store into New Jersey's retail palace by his retirement in 1929. Hunt's second Newark building was at 43 Washington Street, the neo-classical museum completed in 1926. It has been described as 'an austere, relatively modern and simplified version of severe classical design.' Hunt and John Cotton Dana, the museum's first director, wanted to create a building inviting to people and easily accessible from the street, not a closed temple in an isolated park.